On Sale! 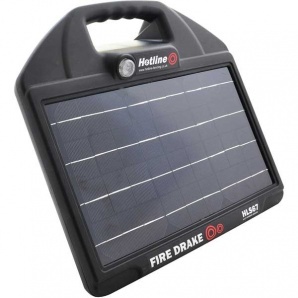 The FireDrake 67 Electric Fence Solar Energiser, made by Hotline here in Devon, is incredibly easy to use. The unit holds an energiser, a solar panel and a rechargeable battery all in one. The solar panel constantly recharges the battery inside the unit, which means that you no longer need to worry about your energiser! In the UK these energisers are very reliable. For 9 months of the year your solar energiser will run without any help from you. During the darkest winter months, you may need to give it a couple of charges from the mains. The mains charger is included. The FireDrake 67 is a medium powered electric fence energiser that will power short to medium length fences of up to 5km of multi-wire fencing. It has an output of 0.5 joules. We Say: This is a robust unit that is maintenance free and very easy to move around. If you are pressed for time and have a small field, this could be a great solution for you. It is made in Devon and is of excellent quality. Please Note: This energiser requires a 1 metre earth stake. The T Stake is a good option, because it allows the energiser to be mounted directly on the earth stake.